We recently closed the WA5JEC Blanco, TX station. Take-down was made possible by a large number of very generous people who pitched in to remove antennas and tear down the 80' Rohn 25, clean and roll up feed lines and accumulated stuff. On December 31, 2016 Dave, W3DH, removed the three antennas remaining on the 170' Rohn 45 which, along with our shack, will stay with the site. The Intertie three link/repeater station and 14' trailer are both in storage. Earlier, we removed the solar panels, batteries, controller and steel frame, also now in storage. On January 3, 2017 the electric utility called to verify the power was to be disconnected. Now, what of the future? We have left Kerrville an orphan and cut our oldest in-place link interconnect to Austin. Bob, W5RMC will honcho a Dillo reconnect. VP, Corky, WB5CIT, has come up with two possible sites which will require computer simulation to see if they can connect San Antonio to Kerrville. Paul, WA5WPA, our host at Kerrville, has informed us of some of his company's plans wherein we could reconnect. In the mean time, Paul is working with his ISP to get an Ethernet drop for a Raytheon JPS NXU network interface unit, similar to our San Antonio west connection to Jacks Peak. 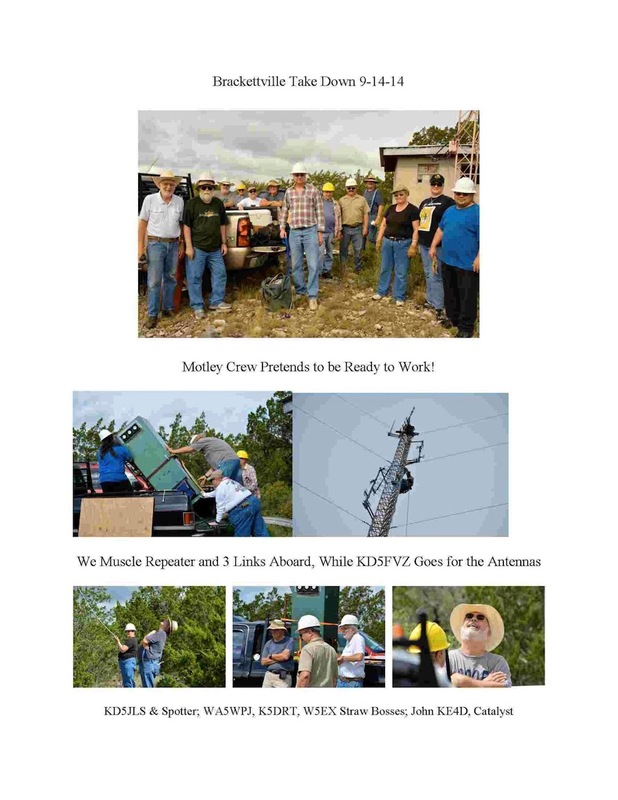 With NXU implemented, Kerrville will be on a party line with Dennis, N5VRP, in Hemphill and San Antonio west, with DTMF access to the Cactus Intertie. Super Dave, W3DH and "Pewee"
Heartfelt thanks to each of you. 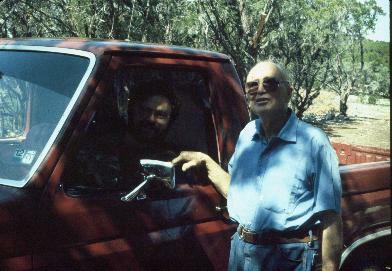 Below is a photo of our benefactor, Al Richards, WA5JEC (SK), who so generously donated hill-top land, a steep access road and mains power, while helping us in every way to establish the original Austin link from the top of his stone water tank near his ranch house - in the 70's! After a 2-year period of nail-biting worry, we were finally forced to move from our top-of-the escarpment Brackettville site. With the help of the newly formed Las Moras Radio Club, led by John, KE4D, we gathered the largest antenna party in our history. (See photos). We got it done in 4 weekends. Assisting from the local club were Jerry KG5AOP, Gene N5FHA, Mike W7MDD, and John, KE4D. Local Intertie members Frank, K5CXR and Greg K5DRT were joined by Mike, KD5FVZ, Helen, KD5JLS, family members Frank and Anna, Bob, W5RMC, John, WA5WPJ, Jack, KT4KL, Greg, K5DRT, Frank, K5CXR, and Joe, W5KTX. Prior to the move, Jack KT4KL, Greg, K5DRT, John, KE4D and I met with the Kinney County Sheriff to obtain permission to move onto their tower. He asked us to appear before County Commissioners to obtain a written resolution of permission. We did so on 2 occasions. The Court voted our permission unanimously. After tearing the entire system out of our shack on the hill we then reassembled it at the new site. Several years ago, the Rio Grande Electric Co. donated a small radio shack to us. Lacking a place to store it, they kept it for us in their yard. Upon our reappearance 5 years later the electric company guys remembered us and even suggested another, better structure. That done, they hauled it to the new site! 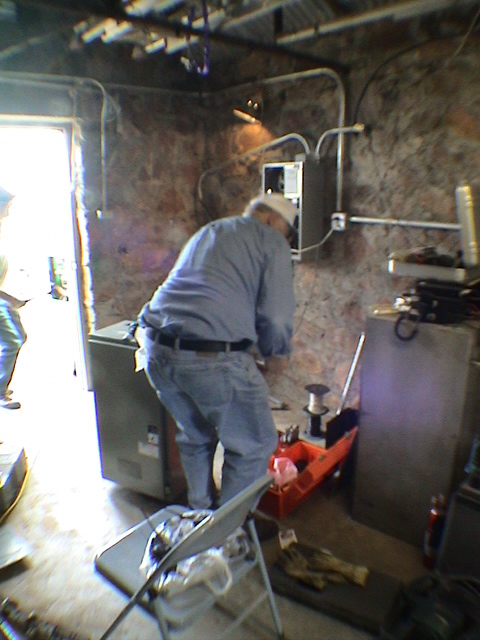 Frank has rewired the shack and installed grounding and a cable pass-through. Later, the local crew arranged for us to move into the adjacent, sturdy air-conditioned building. This change allowed us secure on-site storage for our West Texas group. A beautiful fall day made the job even more pleasant. 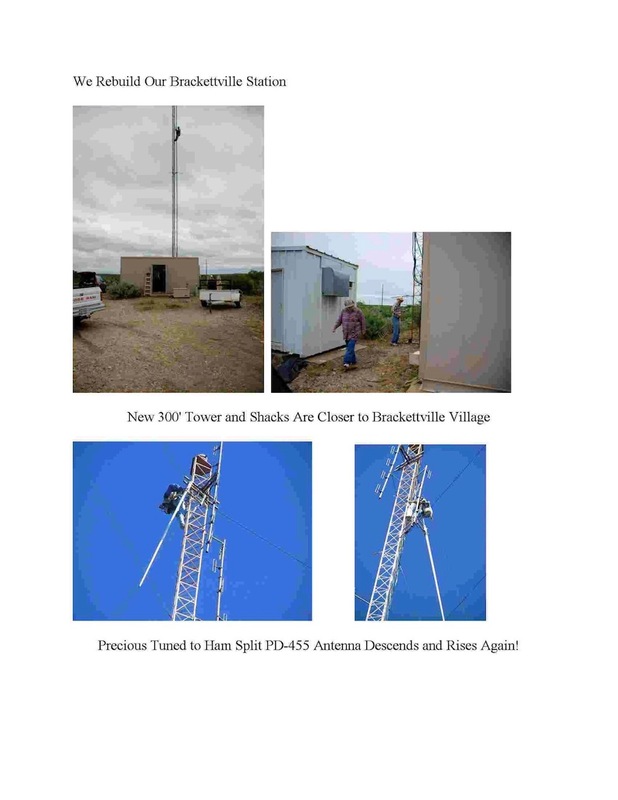 Led by intrepid tower-climbing engineer, Dave Hammer W3DH, we retrieved our PD-455 Super Stationmaster repeater antenna from the old site and later, hoisted it in place along with coax purchased last week. An additional run feeds the hard-to-do Pandale link antennas (Sinclair 307's). We owe much thanks to Helen, KD5JLS, who straw-bossed a 4-5-man group from the Las Moras Radio Club with the cable reel. OM Mike, KD5FVZ, had constructed a supporting rig for the side rail post holes on his Chevy, but the cable reel shredded out its hole for the support axle. This was a dicey business, but we got it done w/lots of grunts and groans. Frank, K5CXR, completed the grounding network. After he powered up Del Rio a clean dial tone issued on command. A week later, we returned to connect the remaining links, and the Los Moras 440 repeater antenna, APRS, and our 2-meter antenna for the remote base. Connectors, lightning protection and new jumpers were installed needed to complete the in-shack RF wiring. Worries concerning intermodulation interference remain just that. Prior to the move we made extensive calculations to detect intermodulation products. We are prepared to QSY if necessary. At the same time, we used the wonderful freeware, Radio Mobile to estimate path losses from the new location. We were pleasantly surprised to see the program predict S-6 signal levels on the longer more-obstructed paths. Two of the 3 links are via scatter; none are line of sight. Conclusion: We did it! After learning of the imminent salvage of our 20-year shack and tower north of town We got written permission to occupy the Kinney County Sheriff's tower. We moved our old station 13 miles south. We took down all antennas and remounted them with new coax from Mark and Frank We hooked it all up and it all works! All links are nearly dead full-quieting. Repeater coverage to Maverick County and Eagle Pass appears promising, Thank you, everyone, for making this happen! During winters of 2013 and 2014, Two very severe ice storms destroyed the rural power feed lines at Mt McElroy. After unsuccessful pleadings with our electrical co-op, we succumbed to solar power. West Texas Connection,, Inc. offered to supply the eight 100 AH batteries, while Intertie purchased panels, mounting framework, and the solar controller. We consulted Tim Apgar, a local architect, for assistance in designing the solar panel support. He offered sage advice concerning wind stability at a site whose winter velocities usually reach 100 mph. He suggested drilling the rock and using epoxy over threaded steel rod to secure the frame, itself constructed of Super-Strut tm. In addition, we purchased several sacks of concrete mix to weigh down Tim’s frame. The frame and solar cells were assembled in town as proof of concept. We designed the frame to accommodate 4 cells, but calculated only 3 would be needed to provide sufficient energy to keep the batteries charged. We specified Solar City tm. Cells because they were the only ones rated for hailstorms. Joe Jankowski, P.E., W5KTX, checked our math prior to equipment purchase. A particular interest of his is specification of proper fusing, which we complied with. We purchased a maximum power point (MPPT) charger – Morningstar Tri-Star 60 tm .as a charge controller. We installed low voltage and thermal overload protective circuitry. We assembled the equipment on Mt McElroy on Dec. 14-15, 2015. Major contributors that day included Ft Davis resident Bob Newman, W5RHN and friend Fran, Rusty Herman, KB5R, and retired Sheriff D’Wayne Jernigan, N5UFV. Mike and Helen Leininger, KD5FVZ and KD5JLD and Red Hollomon, W4WMH did the really heavy lifting. These stalwarts can be seen in accompanying snapshots.